Remember those Domino’s bread bowl pasta meals I recently told you about? You know, the decadent pasta dishes served inside edible bowls of deep dish crust? The ones that, on average, provide 1,400 calories, a day’s worth of sodium, and almost an entire day’s worth of saturated fat? Well, guess what? If you order one between now and September 13, you get a chocolate lava crunch cake (pictured, left) for free! While we’re at it, let’s throw in a large soda and bring this one-meal total to 2,000 calories. Burp. Last week I told you about Domino’s Bread Bowl Pastas: your choice of penee entree (including three-cheese mac and cheese) inside a bowl comprised of Domino’s pizza crust. Alas, Small Bites reader Eleonora Roversi alerted me to the appearance of this product’s calorie values. As I predicted in my original post, we are looking at four-digit calorie values for each of these bread bowls! My next prediction: Domino’s pasta bread bowls will go the way of blue ketchup and New Coke. Say What? : Pasta… in a Bread Bowl? 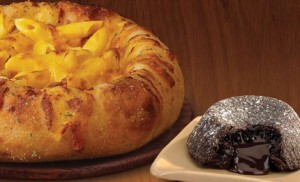 Behold the latest creation from Domino’s Pizza — penne pasta entrees… served in a bread bowl! Not too surprisingly, calorie information is yet to be posted, and the four calls I made to their corporate headquarters proved unsuccessful. It doesn’t take many brain cells, though, to figure out that items like chicken carbonara, Italian sausage marinara, chicken alfredo, pasta primavera, and three cheese mac-n-cheese nestled inside a thick round piece of bread are far from “light” options. I’m willing to bet we are dealing with 4-figure calorie values. As soon as the reveal occurs, I will post it on Small Bites. 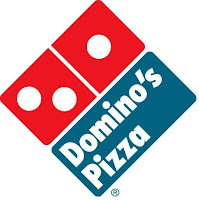 A slice of Domino’s deep dish cheese pizza contains 95 more calories than a slice of their thin crust cheese pizza. I purposefully posted this item to prove the point that even when faced with fast food options, there is always a healthier choice. If we’re talking about eating two slices of pizza, the deep dish variety contributes a total of 190 extra calories than a thin crust version! And what to do if your next office meeting offers nothing but deep dish pizza? Make another smart choice — leave the end crust (about 50 – 60 calories per slice) on your plate. 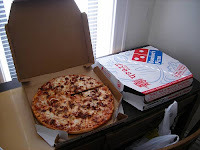 A slice of Domino’s deep dish cheese pizza contains _____ more calories than a slice of their thin crust cheese pizza. Leave your guess in the “comments” section and come back on Tuesday for the answer. Yesterday evening, after a grueling workout, I passed by a Domino’s. There’s usually nothing to see except for a few bored employees. However, yesterday was different. I couldn’t help but laugh when my eyes fixated on the poster you see on your right. If you’ve ever dreamt of a pile of Oreo bits and streams of vanilla sauce on sweet pizza crust, your processed food genie has granted your wish! Part of me wants to get one for taste-testing purposes. I can’t help but wonder — are there cold toppings on a hot crust? Hot toppings on a hot crust? Warm Oreos but cold vanilla sauce? In reality, two people are probably splitting one, meaning they are each taking in 480 calories, 16 grams of fat, 4 grams of saturated fat, and a Coke can’s worth of sugar. As far as the ingredients go…. well, if you’re trying to only eat foods that contains a handful of ingredients, I’d suggest skipping this one.